For some of the world's most pressing water questions, the answer is in nature. Clean, plentiful water depends on healthy surrounding natural systems such as forests. Much of the world's water is filtered through forested watersheds, which improve water quality and protect water supply. Large forests like the Amazon even help control the "rivers of the sky," which dictate rainfall patterns hundreds of miles away. While both the world's forests and water supply are under threat, their intertwined relationship also means that these systems can be improved simultaneously. Current water crises are impacted by three specific challenges – climate change, forest fires and extreme weather – all of which can benefit from valuing and restoring forests. Greenhouse gas emissions are warming the climate, increasing the intensity and variability of rainfall. Clouds are being pushed poleward, increasing risks of drought in the regions where much of the word's food is grown. From flooding to dry spells to melting glaciers, we will continue to feel much of climate change's impacts through our water systems. Trees are nature's best method for carbon dioxide sequestration, as they absorb and store this greenhouse gas as they grow. 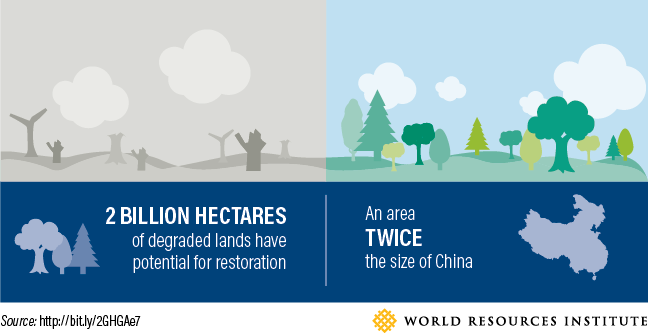 Forests already absorb one-third of the world's fossil-fuel emissions, but there's room for improvement: An additional 2 billion hectares of degraded lands are ripe for restoration. Scaling-up the ability of forests to sequester carbon will play a critical role in mitigating climate change and curbing its impacts on the world's water. Healthy forests serve as insurance against a growing threat to water quality: wildfires. As evidenced by the flames that wreaked havoc on California last year, warming temperatures and unnaturally dense forests create a perfect environment for catastrophic wildfires. Beyond threatening lives and destroying property, wildfires also send soot and ash into nearby water bodies. Forests can take decades to regrow after a fire, so these events also damage the ability of forests to filter water and control soil erosion for years to come. Part of the reason wildfires strike and rage out of control is that forests are often overgrown from the suppression of smaller, naturally-occurring fires, and are full of dead trees due to insects, disease and drought. The Forest Resilience Bond links stakeholders who can benefit from reducing fire risk and intensity and cleaner water – like the U.S. Forest Service, water utilities, cities and bottling companies — to watersheds at-risk of devastating fires, allowing them to make payments towards proactive forest management. By removing dead plant matter and managing overgrown forests, the risk of destructive wildfires — and major water pollution events — will be decreased. Cities have been center stage during many recent water crises, including Cape Town's threat of a "Day Zero" water shut-off and Houston's flooding during Hurricane Harvey. As the world's urban population soars, cities will continue to face both droughts and extreme weather events, threatening day-to-day life, livelihoods and economic growth. Forests can help cities in two ways: First, restoring and protecting forested watersheds around cities can naturally purify water, making water treatment from utilities more affordable. For example, New York City invests around $100 million annually in protecting its upstate watershed, which helps filter approximately 1.4 billion gallons of water for the city. This investment preempted the city's need for a new, multi-billion dollar filtration plant. Forests also buffer cities from the impacts of extreme weather. Their soils and root structures absorb water, preventing flooding. This stored water also helps increase water flow during times of drought. Houston and Bangalore have both suffered massive flood crises partially due to excessive development at the expense of the natural sponges that surround them. San Diego, meanwhile, found that its urban forests provided the same flood benefits as $160 million worth of built infrastructure like walls and dams. Sometimes the best answer to daunting problems is the simplest one. Restoring and protecting forests today is one measure that can help prevent the water crises of tomorrow.